After much thought and consideration, I have decided to support Hillary Clinton in the Pennsylvania primary. As many of you know by now, Pennsylvania's primary may prove to be pivotal in selecting the next Democratic president of the United States. 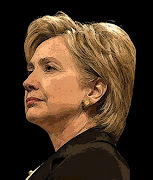 While I like and admire Senator Barack Obama, I feel that, at this time, Senator Clinton is best suited for the job. In addition, Senator Clinton may have a better shot at defeating Republican nominee John McCain, who has committed to continuing the war in Iraq. 100 Bloggers for Hillary: see www.PresidentHC.com for more details (left panel). If you agree that Hillary is our best shot in November, please consider signing up for the blogger team. Pennsylvanians: no matter who you decide to support, be sure to vote for your candidate of choice on April 22; your vote will make a difference. Feel free to forward this email. Please consider sending a similar message to your friends and family.